James Proimos: AP Newsbreak: Suzanne Collins/James Proimos Picture Book Coming Out In 2013. 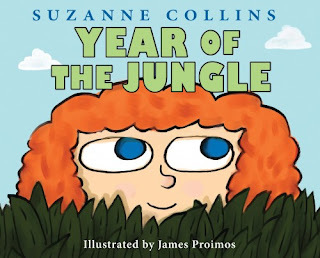 AP Newsbreak: Suzanne Collins/James Proimos Picture Book Coming Out In 2013. “The Hunger Games” novelist Suzanne Collins has a new book coming out next year. The multimillion-selling children’s author has completed an autobiographical picture story scheduled for Sept. 10, 2013, Scholastic Inc. announced Thursday. The 40-page book will be called “Year of the Jungle,” based on the time in Vietnam served by Collins’ father, a career Air Force officer. Scholastic also announced Thursday that “Catching Fire,” the second “Hunger Games” book and originally released in 2009, is coming out in June as a paperback. The paperback edition usually comes within a year of the hardcover, but “Catching Fire” had been selling so well that Scholastic waited. “Mockingjay” has yet to be released as a paperback. Next summer, Collins’ five-volume “The Underland Chronicles,” published before “The Hunger Games,” will be reissued with new covers. “’The Underland Chronicles,’ with its fantasy world and 11-year old protagonist, Gregor, was designed for middle readers,” Collins said in a statement. “The ‘Hunger Games’ trilogy features a teen narrator, Katniss Everdeen, and a stark dystopian backdrop for the YA (young adult) audience. ‘Year of the Jungle’ attempts to reach the picture book readers by delving into my own experience as a first grader with a father deployed in Vietnam.